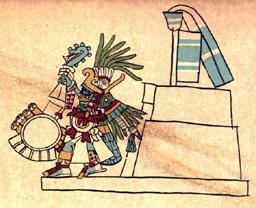 Huitzilopochtli, or “The Hummingbird on the Left,” was one of the most important gods to the Aztecs, particularly the Mexica of Tenochtitlan. He is best known as a god of war and the sun, though he is far more complex than that. He appears in several myths as a brave guardian of those under His aegis, such as His defense of His mother, Coatlicue, from Coyolxauhqui the Moon Goddess and the Centzon Huitznahua, the Stars of the South, and His protection of the Mexica on their journey south to the site of Tenochtitlan. In His guise as the Sun, He gives warmth and light to the earth so that life may exist. Thus, not only does He destroy, but He creates new things in the place of the old and preserves the larger system that contains all that is. He is Order and Chaos, Life and Death all in one, a recurring pattern among the high gods of this pantheon. We can get an idea of His personality from the myths as well. He is fierce of course, shown by his relentless destruction of all but a lucky few stragglers of the Centzon Huitznahua even after They realized that they couldn’t defeat Him and begged for mercy. He is also loyal and loving towards those He considers “His,” as shown by His spirited defense of His mother and the Mexica — this characteristic earned Him the title of “Protector of Men.” Often described as the “Portentous One” who’s always rushing about, He’s full of wild energy and exuberance. This energy and ferocity is tempered by an inner resolve and clear head, as shown by His calm bravery even when outnumbered by the army of the Four Hundred Southern Stars or faced with His sister’s deadly sorcery. My retelling of the legend where Huitzilopochtli spoke to His people while they were still wandering Chichimec nomads living in Aztlan, telling them to head south to the site of Tenochtitlan. I took a fair amount of poetic liberty with this one, since this event generally gets just a couple of lines in the original sources, so I fleshed it out a fair bit with more detail I believe stays true to the spirit of the myths in general. In this myth, I recount the conflict between Huitzilopochtli and His malicious sister, Malinalxochitl. Accompanying the Hummingbird on the Left and the Mexica, She’s been tormenting the helpless mortals, until Her brother loses His patience with Her ways and puts a stop to Her evil games…but Malinalxochitl’s plans for revenge have just begun. Elizabeth Hill Boone’s excellent monograph on Huitzilopochtli. The only full-length English study of this particular god available at this time. The American Philosophical Society has generously allowed Google to scan and host it for the public to read, though it may not be downloaded due to copyright. Huitziilopochtli is a very interesting deity; He reminds me very much of Thunor. It’s interesting how They both are associated with a legendary weapon that has a fiery or lightning-like nature. Huitzilopochtli’s deadly javelin, the xiuhcoatl (Fire Serpent), is often interpreted as a thunderbolt, even though He’s not technically a storm god. However, he *does* have an association with the cluster of gods involved with wind and storm — one of the myths recounts how Tlaloc the lord of rain and storm adopted Huitzilopochtli as His son, and the sanctuaries of both gods shared the pinnacle of the Grand Temple. Additionally, Tlaloc *also* carries a divine “serpent” weapon — He’s sometimes depicted in the codices with the Water Serpent, an unmistakeable thunderbolt symbol. He’s also frequently shown with an axe, another object with lightning associations. In that light, I think it’s interesting that, apparently, there’s some evidence that Thunor’s hammer may have originally been an axe, according to the site below. Comparative religion never gets old. Addendum to my last comment — Spotted some broken links on this page that I missed when I migrated the site, got those cleaned up. Also realized I was missing a relevant myth on this page and added it. Everything’s back in order now though! I am glad you made that connection too. It’s interesting to see similarities between deities from two different parts of the earth. I never knew about Huitzilopochtli’s weapon though. Then again, my knowledge of Him is quite sparse. All the more reason to read more about him I suppose. I never knew about Thor wielding an axe though. Very interesting tidbit. I would imagine that Tlaloc and Thor would have similarities seeing as they both have similar spheres of influence. I agree, comparative religion never gets old. Excellent, I’ll be sure to check out those links.